This truly unique western-tooled vinyl covered Deluxe Reverb with a wheat gille cloth just screams "Moxie"! The 22-watt ’65 Deluxe Reverb amp is for rock, country or blues players who want a moderately powered amp they can crank up at the gig or in the studio. 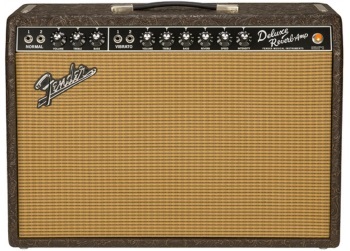 The full, snappy guitar tones heard on many famous recordings from Memphis to Abbey Road were made using the Deluxe amp. Features include dual 6V6 Groove Tubes output tubes, one 5AR4 rectifier tube, four 12AX7 preamp tubes, two 12AT7 tubes, one 12” 8-ohm Celestion Cream Alnico speaker, dual channels (normal and vibrato), tube-driven Fender reverb, tube vibrato, two-button footswitch for reverb and vibrato on-off, brown western tooled vinyl covering, wheat grille cloth, and limited edition badge.